Hello and welcome to my nook on the internet. This little corner of the web is about the things I'm currently interested in. My interests tend to vary over time, and while I might be continuously interested in some topic, it might not enjoy any actual attention for some time as other interests wax and wane. When my father still worked he had a workshop full of machine tools and I learnt a little bit of machining on them after school. The school I went to did not offer metalwork, only woodwork, so I was left to teach myself. 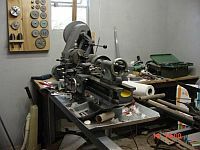 What with military service, then university, then my first job, I had no opportunity for more machine work for many years, but it stuck in my head as a dream, to own my own lathe. See the metalworking pages for the story of getting a lathe, and my adventures in making tooling for it. I grew up with steam locomotives audible from anywhere in town, and had the usual 'trainset' as a child. Later I dreamt of building a hovercraft with a Cox Baby Bee engine and managed to get the engine for a birthday. However, I then discovered that the balsa I needed was way out of my budget and the project languished. Another factor was that I had no idea how to start the engine, and I am alergic to the methanol fuel, suffering from excess mucus and headaches after contact. After a few years of toying with it, I swapped the Baby Bee for a bigger trainset than I'd ever had. That started me going and I found I could afford the odd wagon or some tracks every few months. This was all Lima brand and I still have all of it, mostly in the original boxes. It was this love of trains that fueled the desire for machine tools, since many small parts for repairing models require a lathe. Now that I have a lathe, I find myself making a 5 inch gauge electric loco. Visit my metalworking pages for more on that. A few years back I decided to get out the Lima models on New Years Eve and that is now a traditional activity to bring in the new year, all the kids staying up waaaay past bedtime to play trains. That early Baby Bee was an offshoot of a desire to fly radio control aeroplanes. Some of my earliest memories are of going to airports (and harbours) with the family just to have a look around. Included were trips to the model airfields in Port Elizabeth and East London, where I recall seeing an engine fly straight out the front of a 'plane in flight. I had a collection of advertising material that I used to drool over, mainly from Graupner. Since then I have purchased the odd RCM&E magazine, the earliest one I currently have is November 1989. Click the 'Radio Control' link in the menu to see the final result of all this drooling. I hope you'll enjoy my scribblings on my pet (for the moment) subjects. Have a nice read. Last modified: February 20 2013 16:25:52.